The following post election report on Sunday’s Greek parliamentary elections is provided by Kostas Gemenis, Assistant Professor of Research Methods at the University of Twente and member of the research team behind Choose4Greece, a voting advice application for the May and June elections, and Roula Nezi, PhD candidate at the University of Athens and Visiting Fellow at the University of Twente. An extensive election report on the May and June 2012 elections will appear in the future in Electoral Studies. The May 6, 2012 election produced a stalemate as the winner of the election, conservative New Democracy (ND)m earned only 108 seats, 43 short of the number necessary to form a government. After less than a week of negotiations it became clear that it was impossible to form a coalition government. The parties were not only divided along the left-right dimension, but also along the issue of the memoranda singed with the “troika” (EU/ECB/IMF). The conservatives along with the incumbent social democrats of PASOK (who had just experienced the worst defeat in their history) commanded a total of just 149 seats, two short for being able to form a government. The Democratic Left (with 19 seats), the most moderate party of the ones opposing the memoranda was somewhat willing to support a ND/PASOK coalition under the condition that the country would stay in the Eurozone but would gradually abandon the memoranda, although this was not perceived as a viable scenario. On the other side, the anti-memorandum camp of the Coalition of the Radical Left (SYRIZA) which came second and the ND splinter Independent Greeks were not only deeply divided along the left-right dimension but the refusal of the Communist Party of Greece (KKE) to enter any coalition talks and the exclusion of the Nazi sympathizers of Golden Dawn meant that, even with the support of the Democratic Left, the anti-memorandum bloc would command only 104 seats. These were not enough even for a minority government of 120 seats as stipulated by the Constitution. Under these circumstances, a follow-up election was scheduled for June 17. The June election was contested after a highly polarized campaign between ND and SYRIZA courtesy of the complex and idiosyncratic electoral law in Greece which awards a 50-seat bonus to the first party. Both ND and SYRIZA tried their best to finish first in order to get this bonus and have the upper hand in the subsequent coalition talks. On the one hand, the conservatives argued that abandoning the agreements with the troika would lead to an exit from the Eurozone and described in catastrophic terms what would entail a return to the national currency, the drachma. SYRIZA, on the other hand, painted a gloomy picture of what could happen if Greece would stick to the agreements: even harsher austerity measures and widespread poverty. Another aspect of the electoral law, the 3% threshold for parliamentary representation, contributed to the main parties’ polarizing strategy. The May election produced a record 19.02% of the vote cast to parties which did not make the threshold. This motivated some of the smaller parties to support the two main contesters of the June election or form electoral coalitions among themselves. After an invitation from the conservatives, the leader of Democratic Alliance (2.56%), a liberal-conservative ND splinter which supported the memoranda, announced that she would suspend her party and that the most prominent candidates will run on prime places in ND tickets. The ND leader extended the invitation to the radical right Popular Orthodox Rally (LAOS, 2.9%). When its leader refused to support the conservatives, his cadres defected en masse to ND. The liberal-conservative “Recreate, Greece!” (2.15%) and the electoral coalition between two small liberal parties Drassi/Greek Liberals (1.8%) decided to join forces with the hope of passing the 3% threshold. The Ecologist Greens (2.93%) entered into talks with both SYRIZA and the Democratic Left but in the end decided to continue on their own. Two more parties which suspended their operations after the May election, and whose voters were expected to support anti-memorandum parties, were the PASOK splinter Social Agreement (0.96%) and the “No” party (0.92%). The election results largely confirmed the expectation that the electoral law and the polarizing climate of the campaign would usher voters towards the two main contesters, ND and SYRIZA. Each of these parties attracted more than half a million additional voters which translated to roughly an extra 10% of the vote for each. From the parliamentary parties, KKE on the left and Independent Greeks on the right suffered the largest losses (8.48 to 4.5% and 10.61 to 7.51% respectively). From the extra-parliamentary parties, two on the left and two on the right were hit particularly hard. These were: the Ecologist Greens (2.93 to 0.88%), the Front of the Greek Anticapitalist Left (1.19 to 0.33%), LAOS (2.9 to 1.58%) and the “Recreate, Greece!/Drassi/Greek Liberals” coalition (3.95 to 1.59%). 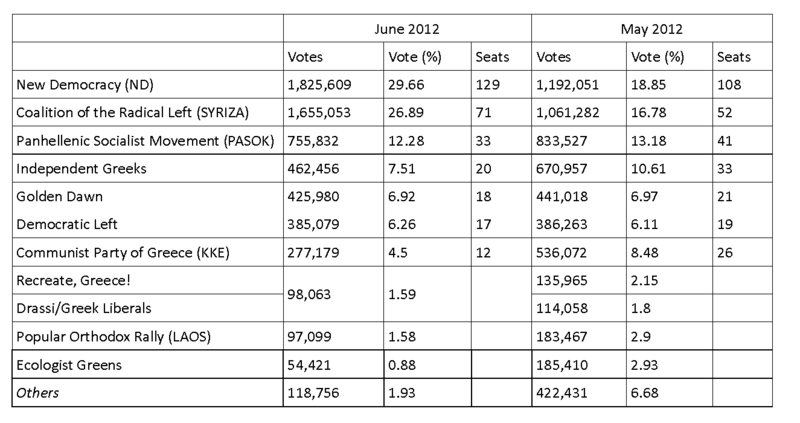 PASOK, the Democratic Left and Golden Dawn achieved similar results to the May election. In the end, ND managed to win the election by draw more voters from smaller parties than SYRIZA did. The June result gave ND more seats (129) but the conservatives are still in need of coalition partners. SYRIZA refused to participate in government coalition talks and declared that it would oppose the government in the parliament and the streets. Sensing that the country cannot withstand another follow-up election, PASOK and the Democratic Left appear to be more willing to support the conservatives in the on-going coalition talks. PASOK is well aware of the dire consequences of incumbency during times of austerity and is internally divided as to the nature of the support that should be given to the conservatives. Some argue for mere parliamentary support, others for suggesting a number of technocrats for posts in a cabinet with a fixed two-year tenure, while others are in favour of taking up cabinet posts. The Democratic Left is at an even more awkward position. The party apparently wants to influence policy and the renegotiation of the terms of the bail-out agreements without being tainted as a party that supports the conservatives. Moreover, there seems to be disagreement regarding the who is going to be the prime minister, with the Democratic Left opposing the ND leader. Whatever the outcome of the coalition talks, one thing is certain: that the weak and divided government will face immense challenges in Greece and abroad. Appreciate the effort Kosta. I am curious what happened to Drasi/DX. 1.5% is next to a catastrophe!